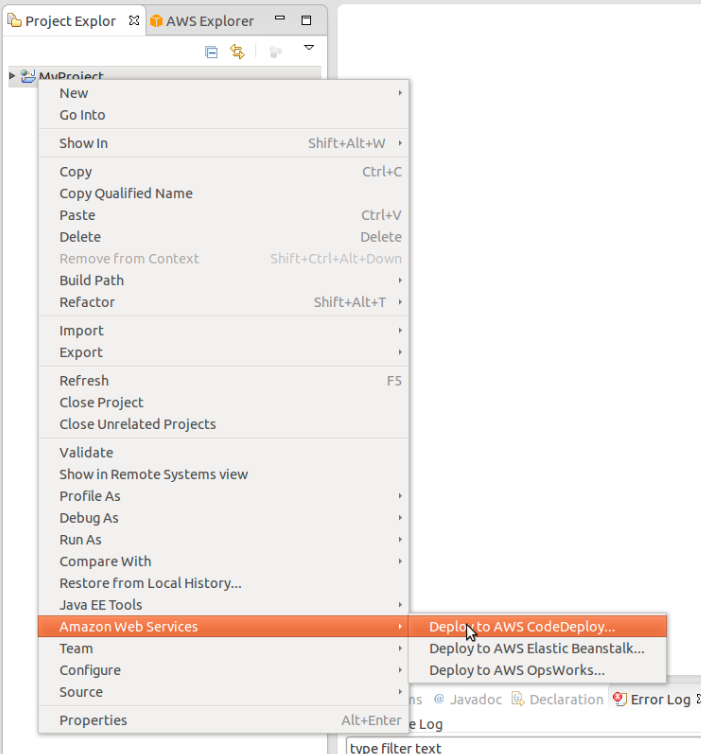 In this part of the blog series, we will show you how to deploy a Java web project to your EC2 instances using the AWS CodeDeploy plugin. If you want to follow the walkthrough, you will need to create a CodeDeploy deployment group to begin with. The easiest way to do so is to follow the first-run walkthrough in the AWS CodeDeploy Console. 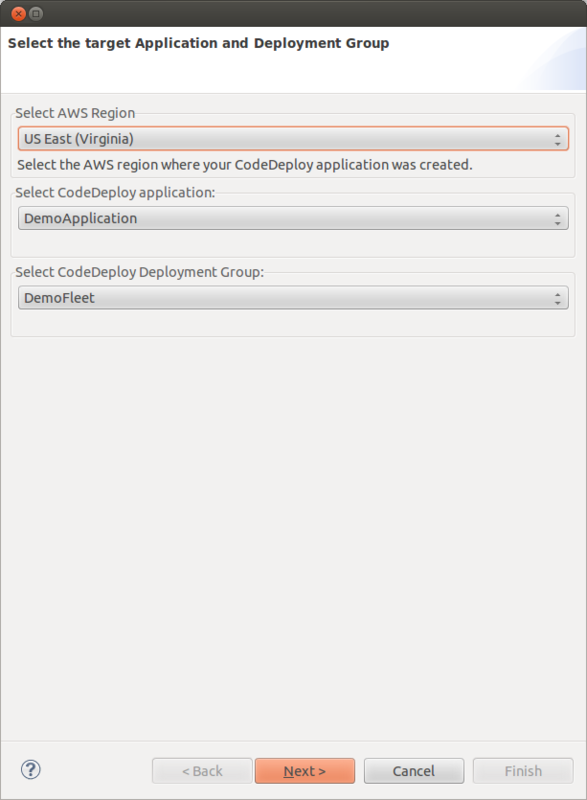 In this example, we have created a CodeDeploy application called DemoApplication and a deployment group called DemoFleet, which includes three EC2 instances running the Amazon Linux AMI. First, let’s open Eclipse and create a new AWS Java Web project in the workspace (File -> New -> Project -> AWS Java Web Project). Select the Basic Java Web Application option to start with. Note that this step is the same as how you would start a project for AWS Elastic Beanstalk. In Project Explorer, right-click on the new project, and select Amazon Web Services -> Deploy to AWS CodeDeploy…. In the first page of the deployment wizard, you will be asked to select the target CodeDeploy application and deployment group. In this example, we select “DemoApplication” and “DemoFleet” which we just created in the console. In the next page, you can specify the following options for this deployment. CodeDeploy deployment config – Specifies how many instances you would want the deployment to run in parallel. In this example, we select “CodeDeployDefault.OneAtATime” which is the safest approach to reduce application downtime. Ignore ApplicationStop step failures – Indicates whether or not the deployment should stop if it encounters an error when executing the ApplicationStop lifecycle event command. S3 bucket name – Specifies the S3 bucket where your revision will be uploaded. Click Next, and you will be asked to select the AppSpec template and parameter values for this deployment. At this moment, you should see only one predefined template, Tomcat 7 running on Linux. This AppSpec template includes the lifecycle event commands that spin up a Tomcat 7 server on your EC2 instances and deploy your application to it. 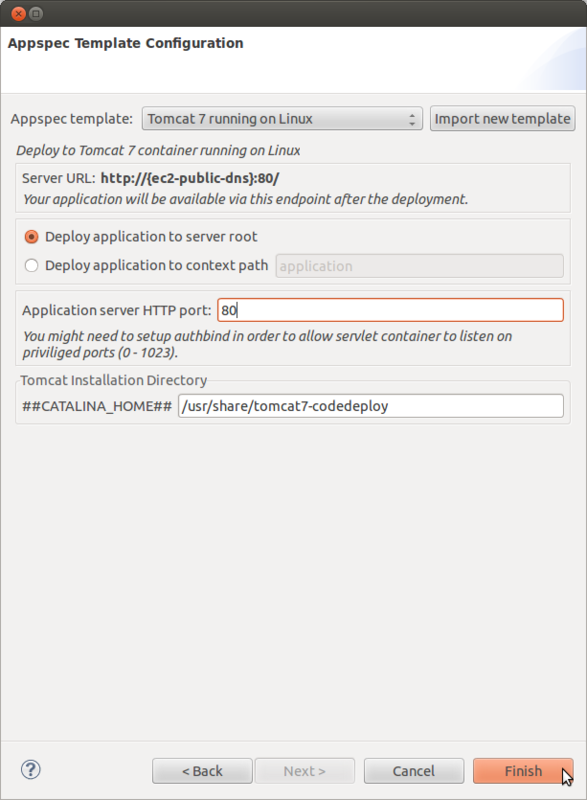 The template accepts parameters including the context-path of the application and the port number that the Tomcat server will listen to. We will explain later how the AppSpec template is defined and how you can add your custom templates. Here we select deploying to server root and using the default HTTP port 80. Then just click Finish to initiate the deployment. After the deployment starts, you will be prompted by a dialog that tracks the progress of all the deployments on individual EC2 instances. You can double-click on any of the instances to open the detailed view of each lifecycle event. 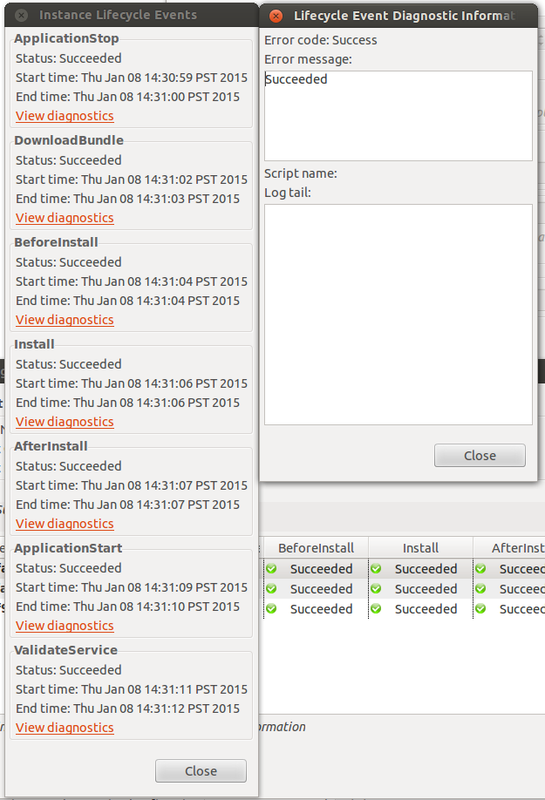 If the deployment fails during any of the events, you can click View Diagnostics to see the error code and the log output from your command script. To view the full deployment history of a deployment group, we can visit the deployment group detail page via AWS Explorer View -> AWS CodeDeploy -> DemoApplication -> Double-click DemoFleet. For some of you who have been following the walkthrough, it’s possible that you might not see the sample JSP page when accessing the EC2 endpoint. Instead it shows the “Amazon Linux AMI Test Page”. This happens because the Amazon Linux AMI pre-bundles a running Apache HTTP server that has occupied the 80 port which our Tomcat server also attempts to bind to. To solve this problem, you will need to run `sudo service httpd stop` on every EC2 instance before the Java web app is deployed. Without the help of CodeDeploy, you would need to ssh into each of the instances and manually run the command, which is a tedious and time-consuming process. So how can we leverage the CodeDeploy service to ease this process? What would be even better is to have the ability to save this specific deployment task into some configurable format, and make it easily repeatable in the future. In the next part of our blog series, we will take a look at how we can accomplish this by using the AWS CodeDeploy plugin for Eclipse.